The Eclipse MicroPen is now available to patients at Santa Rosa’s Plastic Surgery Associates. Francisco Canales, MD and Heather Furnas, MD are pleased to announce the addition of micro-needling services in their Napa Valley office. The technique utilizes the body’s own healing abilities to quickly rejuvenate the appearance. The founders of Plastic Surgery Associates, Dr. Canales and Dr. Furnas, are part of only a select few cosmetic surgeons bringing this procedure to northern California. Micro-needling refers to an innovative technique for improving the skin’s texture and tone using small surface pricks, also known as micro-injuries. The theory behind micro-needling was first advocated in 1952, by French surgeon, Dr. Michael Pastor. Today, the Eclipse MicroPen brings the latest micro-needling technology to aesthetic patients. Using 12 tiny needles, housed within the appliance’s small tip, the MicroPen delivers a set of instantaneous punctures to a target area of tissue. These small lacerations stimulate the body’s healing process, causing the production of additional collagen and elastin. As the skin recovers, fresh tissue is exposed, refreshing the look and feel of the tissue. The Eclipse MicroPen can be beneficial to any area of the body, including the face, arms, neck, legs, and back. The technique will significantly improve the appearance of acne scars, stretch marks, dark spots or hyperpigmentation, and fine lines or wrinkles. Additionally, once the small punctures have been placed on the skin, topical gels, creams, and serums can be increasingly effective. A micro-needling session at Plastic Surgery Associates will take from 30 minutes to an hour to complete. The final benefits from the Eclipse MicroPen will last six months or longer. Some patients will require multiple treatments for the best results. Aside from the Eclipse MicroPen, the full range of cosmetic surgical procedures are available at Plastic Surgery Associates. 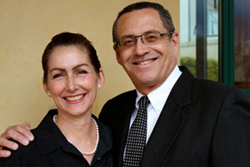 Dr. Francisco Canales and Dr. Heather Furnas are both Board Certified Plastic Surgeons; they established their practice in 1992. Their Santa Rosa office sits adjacent to their newest addition, the Allegro MediSpa. This luxurious medical spa offers safe and dependable noninvasive aesthetic services such as injectables, CoolSculpting, and Ultherapy.